I was just finishing up a spectacular dive in a new area for me along The Sea Ranch. I had been in the 46.8 degree water for 2½ hours, having a hard time making myself leave such a splendid magical place. The visibility in the water was near 30 feet, which is remarkable for this coastline. In my quest for a trophy-sized abalone of more than 10 inches I had measured at least a dozen that were a fraction of an inch short. It didn’t matter to me as I was mesmerized by the beauty of the sea. Purple sea urchins occupied every available nook or hole in the rocks. Red, orange and blue star fish were on their slow patrol looking for food. Blue rock fish darted around me. Algae of every color intermingled with sea grass and kelp. Light danced off of everything refracted by the ever undulating surface. The sounds of sea life popping and clicking beneath the surface provided the soundtrack. “Beautiful” falls far short as a description of what I was experiencing. Alas, reality began to force its way back into my awareness. I was cold, tired, and my muscles were beginning to rebel at the constant exertion, warning me with the first hints of cramping. Reluctantly, I head toward our exit point in the rocks, a place where deep water touches a shallow rock ledge where I can wait for the right wave to lift me up and out of the sea. As I swim, I continue to marvel at the sights below me, though tired I occasionally stop to lower my abalone iron, on the end of a float line, to measure a large abalone on the bottom 20 feet away, while I am still on the surface. Rare conditions indeed. When I reach my exit point, I begin to stow all of my gear back in the dive bag on my dive board. While I am doing this, a small form, about the size of a cat, appears next to me and begins to climb up on my board. Startled at first, I recognize it is a baby harbor seal. I sit motionless and watch as it climbs half way up, looks around with curiosity and slides back into the water. I watch it under water as it comes over to explore me. I see mom about 15 feet away, keeping her eye on her pup but not appearing alarmed. The pup nuzzles me, and I cannot resist gently stroking the top of its head. After a few moments, the pup rejoins its mother as if excited to report what it had discovered. Enchanted by the encounter I forget the camera in my dive bag. I love the sea and all that it encompasses. This is why I abalone dive. Occasionally I take one and feed family and friends, but that is secondary. It is the experience, an experience I can only liken to spiritual. That is also why I dive. Well said! Keep up the good work, and keep diving! 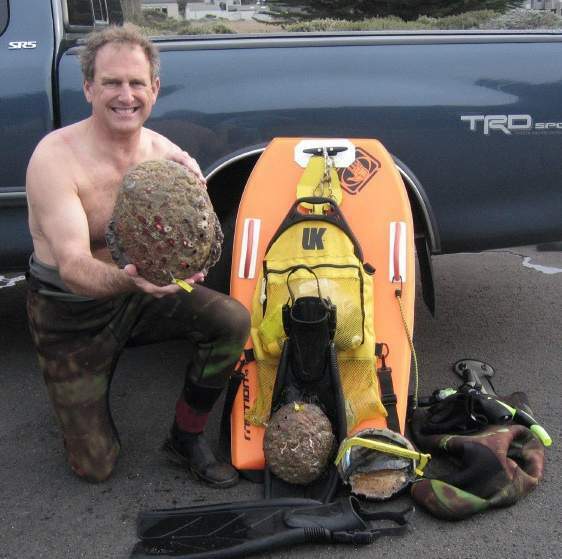 I am new to abalone diving. I have now been out 4 times, so am still learning the nuances (and quite frankly not very good, yet). But it has been one of the most amazing experiences in my life. This article perfectly explains what I have felt while diving. It is hard to explain to somebody who has never tried. I am regretful that it has taken me 40 years to find this amazing “sport”. Wow, Roger! This is incredible 🙂 Great work and continue to enjoy!! Thanks Jen, I’ll drink to that! You look familiar?… I am an old fart still working for Kentfield Fire in Marin. Burn Relay in Sonoma for over 15 years? In your picture group, a number of guys look familiar?? ?… A lot of “sports”, construction and Fire background. Just purchased a hobbie mirage island adventure kayak to fish and dive from. Saw an angled pic of you in an outback… Could you please send me a pic of how you have it “set-up, as I am in the process of installing a “fish finder/plotter, pole mounts, etc.